PP Casita bungalows are one of Phi Phi Don Island's most popular budget accommodation. The combination of great budget prices, the pool and being just 60 meters from the world famous Loh Dalum beach makes this resort heavily sought after and well reviews. 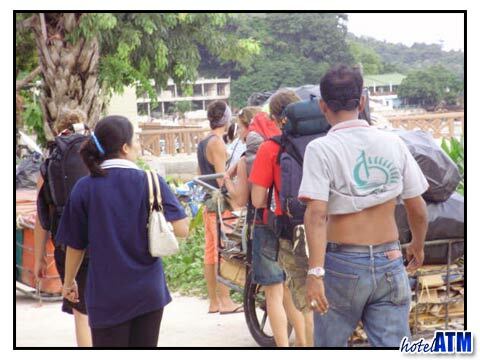 If you are spending the majority of your day out on a dive boat or doing a PADI course, snorkeling or just hanging out on the beach, all you need from your Phi Phi accommodation is a safe place to leave your belongings, a comfortable night sleep and a chance to grab an easy breakfast and get some down time by the pool before hitting the night life. PP Casita has all this and because it is just 2 minutes from the beach, on those days when diving is off, when the lure of sightseeing around Phi Phi Island is not strong, and you just want to lay on the beach Loh Dalum is right on your doorstep. PP Casita Resort is unique on Phi Phi island as not only are the bungalows on stilts but also the walk ways joining the rooms to the main reception. These raised walk ways improve airflow and so not only are the rooms cool the whole layout has the ambiance of a very natural and relaxed place to stay. All the rooms are very well furnished with En suite bathroom facilities, Air Con, TV, mini bar, and a safe. The PP Casita Resort is often one of the first resorts of it's budget to get filled, especially at Christmas, New Year, Chinese New Year and Songkran, the 4 main peak times of the island. On top of that rooms during the peak season (20th December to 20th January) are taken early. There are other resorts in the area but do not have the same quality of room, resort facilities and price. JJ Bungalows Air con bungalows have a similar price, have bigger rooms, no pool and further from the beach (180 meters). Phi Phi Andaman Resort superior bungalows are on the beach front but without a pool but further from the center of nightlife. PP Casita tripadvisor reviews and those reviews taken from this website show that compared to the other resort on Phi Phi Don, it does rather well. PP Casita is part of the Phi Phi Hotel Group which also owns and runs, Phi Phi Hotel, PP Palmtree Resort and Phi Phi Banyan Villa. With economies of scale and superb design and the best maintenance team, the Phi Phi Hotel Group is one probably the best run series of hotels in Phi Phi Don Village.